Earlier this year we announced that we would be conducting a Drupal usability study that we would live stream so viewers could watch as participants worked with Drupal 7. Becky Gessler and I are excited to announce our analysis of the results that we will also present at DrupalCon Denver to the Drupal community in a “core conversation” session with Jen Lampton called “User eXperience for Open Source: How to Galvanize a Community." After the study concluded we posted a YouTube playlist with each participant’s session. 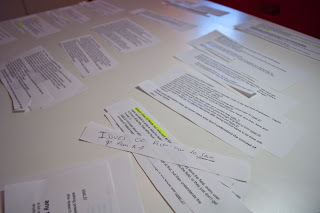 We went through each video and wrote down problems that each participant faced along with direct quotes, then consolidated and grouped these together by issue area. This document was posted on Drupal.org and members of the Drupal community have been filing issue reports to work on fixing specific problems. Conceptual: Most problems that new users encounter boil down to a missing understanding of how Drupal works, particularly the interaction between content, content types, and fields. Flow: While trying to complete tasks, new users frequently felt lost inside Drupal because they couldn’t tell what they were looking at, how they got there, or where they were supposed to go next. Terminology: Drupal is filled with terminology that just doesn’t make sense to new users. Interface: New users don’t trust Drupal because many interfaces are not intuitive. We are excited for discussion in the Drupal community about how to best tackle the problems outlined in these layers. You can find our complete analysis in this report. New users from our study did have some positive impressions of Drupal as well. Once they understood how it works, they were impressed by the power and extensibility that Drupal offers. This study also demonstrated that Drupal 7 brought significant usability improvements over Drupal 6, particularly with the ease of user interaction with administrative tools and the Views creation wizard. We are excited by the success of this study. We look forward to engaging the Drupal community in discussion at DrupalCon Denver during our core conversation, and we are confident that by working together as a community, we can shape Drupal to be more supportive and helpful for new users.